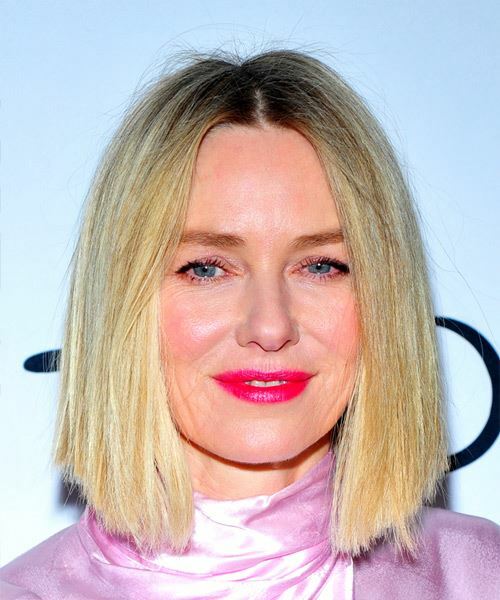 Naomi Watts looks radiant with this medium length, straight hairstyle. The hair is cut bluntly which gives the hair a nice edge look to it. The front of this look is slightly longer than the sides and the back which gives this hairstyle depth and shapes her face well. Please always remember to apply a straightening serum to your hair before you use your hair iron. This will ensure that you keep your hair safe from damage and prevent your hair from looking scruffy. Even though the bottom of this look is more open on the face than the top, glasses will not suit this look very well. In terms of your makeup, a simple eye application is needed and a bold lip will look stunning with this new hairstyle of yours.